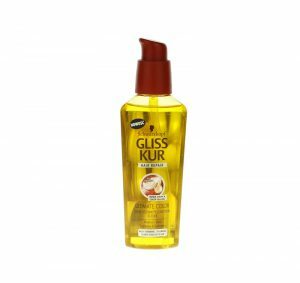 Golden oil for colour-treated hair and highlights captured in a very handy plastic bottle – Gliss Kur Ultimate Color Oil Elixir (Schwarzkopf). It has been designed for hair that needs repair and strength after the colourisation. The cosmetic is saturated with valuable conditioning oils – as many as seven of them. Unfortunately, alcohols and silicones have also been included in the cosmetic whereas a very dense formula may overburden the hair. Ultimate Color elixir with conditioning oils prevents the colour from being washed away and protects the hair from losing the vitality. The characteristic feature of Schwarzkopf Gliss Kur is quality and excellent action of products. Schwarzkopf is among the brands which make use of beneficial action of hair oils. Thanks to the oils, Gliss Kur product suits many women. It is designed mainly for dyed hair and highlights which are supposed to be provided with shine and suppleness by Gliss Kur Hair Repair Ultimate Color. The ingredients of Schwarzkopf Gliss Kur may turn out to be a pleasant surprise. Contrary to appearances, the product contains few artificial substances. They are characteristic of the brand but in this case the amount of silicones and alcohols is limited. It offers a very interesting complex of conditioning oils and sunscreen instead. What are the substances included in Ultimate Color Oil Elixir? Schwarzkopf Gliss Kur Hair Repair Ultimate Color Oil Elixir has been created for women who have colour-treated hair or highlights. It is common knowledge that the strands may be weak after colouring treatment, therefore it needs regeneration and strength. Ultime Color elixir with conditioning oils also provides optimal protection from fading as the repairing serum locks in the colour even up to ten weeks from the moment of colouring. Oil Elixir Gliss Kur Ultimate Color owes its extraordinary nourishing properties to the complex of conditioning oils. Sunflower seed oil is a rich source of unsaturated fatty acids which are perfect for weak hair. Macadamia oil contains a unique omega-7 acid which offers rejuvenating action. Sesame oil protects and boosts hair growth whereas olive oil and almond oil provide proper moisture. Marula oil is the source of all essential nutrients. Schwarzkopf oil for coloured hair is a very oily and greasy formula which may slightly overburden the hair. Strands that are damaged due to dyeing usually absorb well all types of substances. However, the consistency is too thick and it can make them sticky. There is nothing unusual about the fragrance of Ultimate Color Oil Elixir. It is fine. We should praise the brand for a light and handy bottle which (although it is plastic) looks elegant. Gliss Kur Elixir with conditioning oils has a golden colour. The bottle is equipped with a classic pump which makes the product more efficient but we still need a few portions to cover the hair.